If the words bacon and eggs don’t spark off images of breakfast in bed, we don’t know what does! 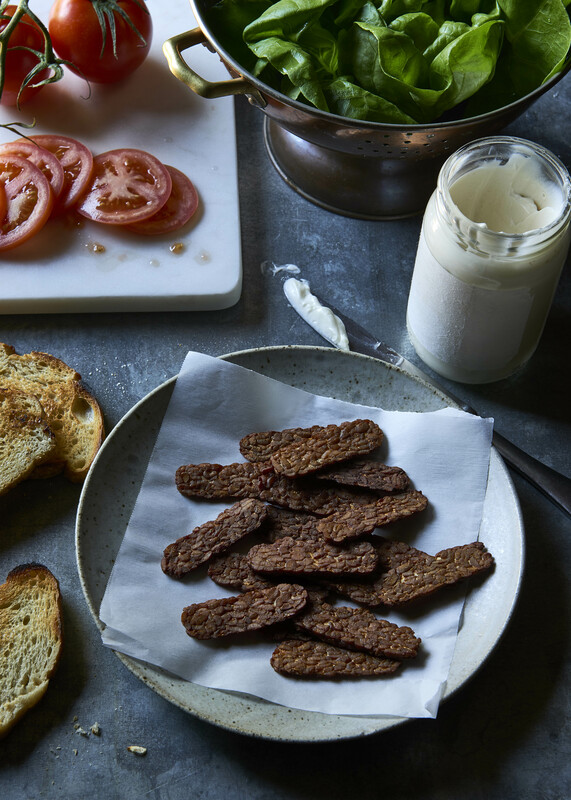 Tess Masters, The Blender Girl is back with a Tempeh Bacon recipe that’s vegan, gluten-free, and a refreshing change from the usually greasy alternative. In a large shallow rectangular baking dish, lay the tempeh slices. In mixing bowl, whisk together the hot broth, tamari, apple cider vinegar, liquid smoke, seasoning powder, maple syrup, chili powder, smoked paprika, and cayenne pepper until well combined. Pour the mixture over the tempeh slices, until evenly coated. Cover the dish with cling wrap, and chill in the fridge to marinate for 2 to 3 hours, preferably for 8 hours or overnight. Preheat the oven to 300°F. Line a large baking sheet with a silicone liner or parchment paper. With tongs, gently transfer the marinated tempeh slices to the prepared baking sheet in a single layer. Discard the remaining marinade. Brush the exposed side of the tempeh slices lightly with coconut oil, and bake for 20 to 30 minutes, until beginning to lightly brown. With tongs or a spatula, turn the slices over, brush the exposed side lightly with coconut oil, and bake for a further 20 to 30 minutes, until browned and crispy.